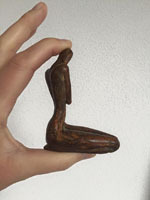 Small bronze sculptures under 500 euro. Edition: 250, this work of art is available. This is a resin sculpture covered with a thin layer of real steel. perfect for a wedding anniversary or as award for a corporate event. Work of art as wedding gift for a married couple. Sculpture as farewell gift for a colleague. Relationship sculpture for a wedding anniversary. Piece of art as marriage gift. This is a resin sculpture covered with a thin layer of real bronze. friendship and partnership are expressed. Sculpture for a man and woman, bride and groom. Work of art for a partner, relationship. 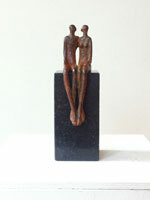 Sculpture for a wedding anniversary. communication in a relationship or marriage. Work of art for a couple in love. 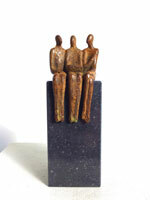 Marriage gift, sculpture for newlyweds. Art for a wedding anniversary. Married? Give this sculpture to your husband or wife. Work of art for companies. Sculpture for a professor, teacher, PhD student. Art for a university, or teaching staff at school. Sculpture for a medical institute, healthcare facility.. The sculpture symbolizes to have admiration for someone. 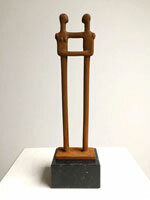 Bronze award statuette for an actor. Sculpture for business use, for an executive. Prize statuette for an entrepreneur or company. Sculpture for an award ceremony. This sculpture doesn't need any explanation, an applause speaks for itself. 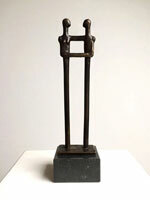 Bronze sculptures for less than 500 euro. On this page: works of art consisting of men and women, autonomous work and especially designed sculptures for companies as business gift or prize sculpture for an award ceremony. All sculptures are packed in a wooden gift box. When you buy a work of art it will be delivered within 7 days. Individuals residing in an EU country have to pay 21% VAT. Small sculptures are more difficult to create than large sculptures. 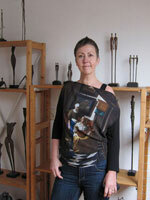 I can design a bronze sculpture for you or your company. It doesn't need to be large, bronze sculptures for business use are mostly small so that they can be used for luxury corporate gifts. Even a sculpture for an award ceremony, doesn't need to be big. 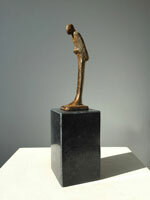 Resin sculptures with a layer of bronze or steel. Affordable art especially designed for special occasions such as a marriage. The resin sculpture is a beautiful wedding gift, but the statuette is just as suitable for an award show or a corporate event. The resin sculpture with a male and a female figure, is suitable as a gift in the relationship sphere for a lover, partner, husband or wife. Wouldn't it be a great marriage gift for a married couple for their wedding anniversary or wedding day? 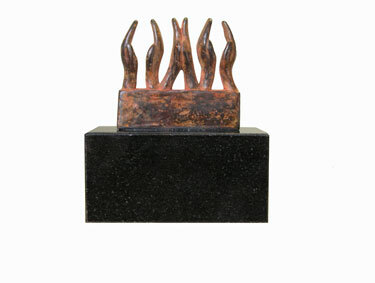 Business gift or award sculpture. The sculpture with a layer of bronze is also designed for companies, so the statuette is also suitable as award or corporate gift for a colleague, business partner, board member.